I got excited when I thought the parrot was named Friday… a few of you will know why! 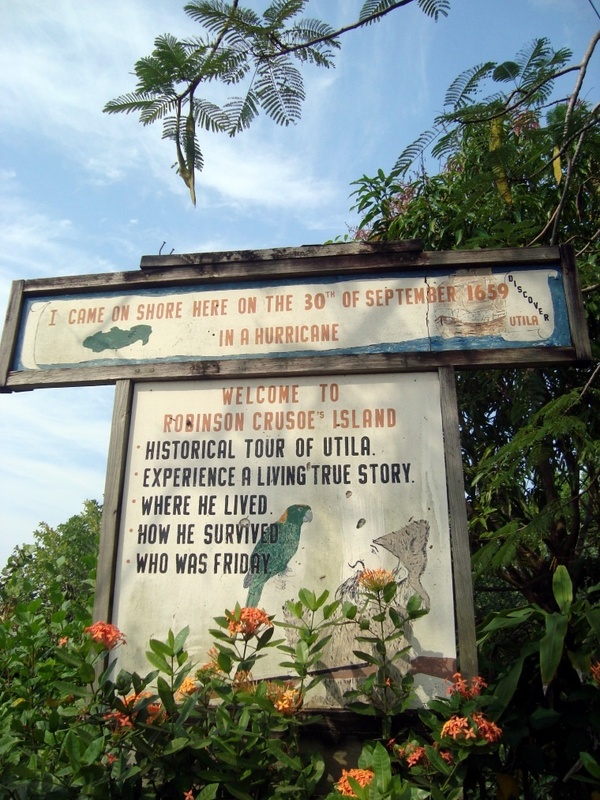 Local legend and signage has it that Utila is the site where the fictional Robinson Crusoe was shipwrecked. (Of course this is widely believed to not be the case, but sometimes it is more fun to just go along.) I thought it should be a no-brainer: every shop in town should sell the book right next to the cash register like gum. But no. Guess not too many people come to Utila to read. Then I discovered a FABULOUS book shop called Funkytown Library. Tucked behind the Reef Cinema with little publicity, I expected just another stack of random books piled in a corner. Instead I found a real used book shop with proper sections based on genre and an awesome selection. I asked after Robinson Crusoe (rather than the official original title: The Life and Strage Surprizing Adventures of Robinson Crusoe, of York, Mariner: Who lived Eight and Twenty Years, all alone in an un-inhabited Island on the Coast of America, near the Mouth of the Great River Oroonoque; Having been cast on Shore by Shipwreck, wherein all the Men perished but himself. With An Account how he was at last as stragely deliver’d by Pirates) and was directed with confidence to the Classics shelf (!). After purusing their selection, I wanted to buy every book they had. But they were expensive–some an high as $10USD for a Penguin Classic edition. Yikes! This entry was posted in Central America, Honduras, Self-reflection by ladyasatramp. Bookmark the permalink.